Plans have been unveiled for a new £1.2bn railway line which could finally link Heathrow Airport with trains from Guildford, Farnborough, Woking and London Waterloo. 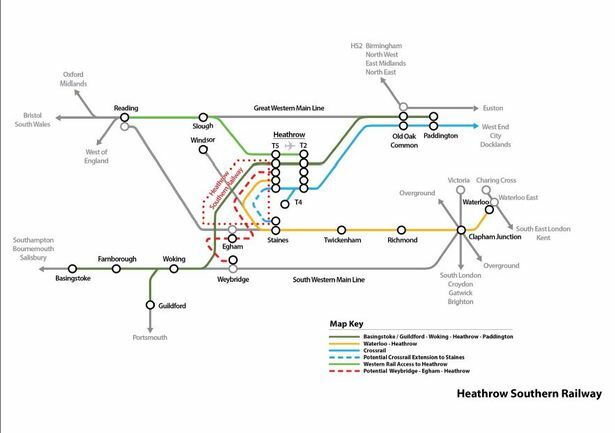 The Heathrow Southern Railway (HSR) proposal aims to greatly improve rail access to the airport. It is not part of Heathrow Ltd. A new route could see trains from Woking go direct to Heathrow at the same fares to those if you were going to Waterloo. The project could also see direct access to the airport from towns such as Weybridge, Egham, Guildford, Woking and Farnborough too. Though still in its extremely early stages, the HSR team have given some consideration thought to how the project could be achieved. Easier rail travel to and from Heathrow for those to the south and in Surrey has been needed for a long time. The proposal includes an additional 8 miles of rail to be constructed along the M25. The HSR scheme hopes to deliver fast, direct and frequent rail access to Heathrow from the south and south west where services are not offered by rail. Also frequent service to Waterloo via Richmond and Putney and links to south London, Sussex and Kent through Clapham Junction and Waterloo East. It could also provide direct trains to Paddington from the south and south west via Heathrow creating an alternative London terminal to Waterloo and with Elizabeth Line providing connections to the West End, the City and Docklands. Plans have been unveiled for a brand new £1.2bn railway line which could finally link Heathrow Airport with trains from Guildford, Farnborough, Woking and London Waterloo. The Heathrow Southern Railway (HSR) proposal aims to greatly improve rail access to Britain’s busiest airport. A new route could see trains from Woking head directly to Heathrow at identical fares to those if you were on your way to London Waterloo. The project could also see direct access to the airport from towns such as Weybridge, Egham, Guildford, Woking and Farnborough too. Albeit still in its extremely early stages, the HSR team have given some consideration thought to how the project could be achieved. Heathrow connectivity has long been a desire not only for residents and passengers, but for business as well. In Surrey, Heathrow is currently inaccessible by direct trains with passengers having to rely on services such as the Heathrow RailAir link from Woking railway station. From London, the London Underground does serve Heathrow Airport, but it is at the furthest extent of the Piccadilly line. It was, however, recently announced the new Elizabeth Line, previously known as Crossrail, would be extended to Heathrow Terminal 5. If granted, the construction of the additional eight miles of railway will see a new bridge being built above the M3 as it runs parallel to the M25. The project team argues while links from central London to the airport are good with Heathrow Express, Piccadilly Line and Elizabeth Line (from 2019), the same sort of service is non-existent from the south. The Government has backed a third runway at Heathrow and emphasised the expansion must meet a requirement for a 55% public transport mode share to ensure the current road traffic levels do not increase further. However, Network Rail forecasts a need for an additional 60% capacity in the high peak hour by 2043 and while the project argues the proposed Crossrail 2 would solve the problem in the long-term, HSR will provide criticially important new capacity in the interim. For more information, visit the HSR website. Our proposed route is in a short section of tunnel from the west end of Terminal 5 station, then mainly on the surface parallel to the M25 to a junction north of Chertsey, together with a connection to the Windsor – Staines line. This direct route delivers much faster journey times from Woking than the earlier ‘Airtrack’ proposals put forward some years ago by airport operator BAA. It also avoids the level crossings in the Egham area which were a major problem for the abortive Airtrack Transport & Works Act Order application. Network Rail’s 2015 Wessex Route Study proposes new flyovers at Woking and Basingstoke and an extra platform at Woking. These proposals, which Network Rail sees as essential to meet future South Western Main Line capacity forecasts, facilitate operation of the services we envisage. Overall, construction of the new infrastructure can be carried out with minimal impact on existing railway operations. The only impacts would be the new junctions on the Staines – Windsor and Virginia Water – Weybridge routes, both of which are lightly-used lines compared to the South Western Main Line. Capital costs of Heathrow Southern Railway are estimated at £1.2 billion, including substantial allowances for specific risks and an overall 30% contingency. We envisage construction will be privately financed, with HSR’s ownership remaining in the private sector after completion. HSR is a great example of implementing the recommendations of the Shaw Report into the future of Network Rail which envisaged that ‘projects that are separable from the core of national infrastructure… which could be structured to be attractive to the private sector and deliver value for money would also represent an attractive opportunity… in these cases financing by third parties can be structured against the funding of a predictable future long term revenue stream…’ (para R6.32). We have set up a new company (Heathrow Southern Railway Ltd) to take this project forward. Whilst ownership would remain with HSR Ltd, the infrastructure would be regulated by the Office of Rail and Road (ORR), and we would expect that its operation and maintenance would be contracted out, on a similar basis to High Speed 1. HSR Ltd would be at risk for the costs of planning and construction of the new railway, in return for contractual commitments from the Department for Transport to purchase a defined quantum of train paths at a predetermined price. The price would be negotiated in advance with the parties involved and with the full participation of ORR, and would reflect an appropriate return on capital at the various stages of the project. The initial expenditure in promoting the project is high risk and would therefore justify a high rate of return, with a lower return during the construction phase, while still reflecting the inevitable uncertainties during a major construction programme. After completion, maintenance and renewal costs would be significantly lower risk, and subject to periodic review by ORR. We do not envisage Heathrow Southern Railway Limited taking direct revenue risk for the project. The franchising structure already provides effective transfer of revenue risk to the private sector, and would enable management of the revenue risk as a coherent whole, rather than being based on an allocation of revenue to the new infrastructure, which in turn would be dependent on the overall pattern of train services on the relevant parts of the rail network. To maximise passenger benefit, fares from Woking and beyond to Paddington should be identical with Waterloo fares. We’re confident that this is an imaginative, well thought-out project that will serve a number of major new rail markets and bring great benefits to passengers and communities whilst being financed and built by the private sector. Our development work to date has been fully supported by professional consultancy, including First Class Partnerships, Aecom, Gardiner & Theobald and Bircham Dyson Bell. When announcing the Government’s decision on Heathrow in Parliament on 25 October, Chris Grayling, the Secretary of State, stressed the importance of accelerating the construction of southern rail links to the airport. But Heathrow Southern Railway does much more than that: it’s a smart scheme – with just 8 miles of new railway, it connects the South Western and Great Western networks to provide new journey opportunities for both airport and non-airport passengers, with significant crowding relief to the South Western network. Heathrow Southern Railway is surely the best possible prospect for developing private sector investment in rail infrastructure in Britain. 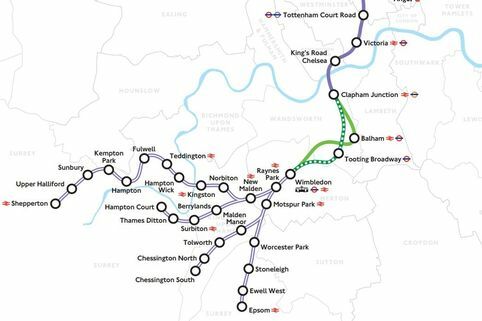 Plans have been published for a new railway connecting the Great Western Main Line with Heathrow and Waterloo – via Windsor, which could be a link creating a future ‘M25 rail route’ encircling Greater London. It is considered to be feasible. 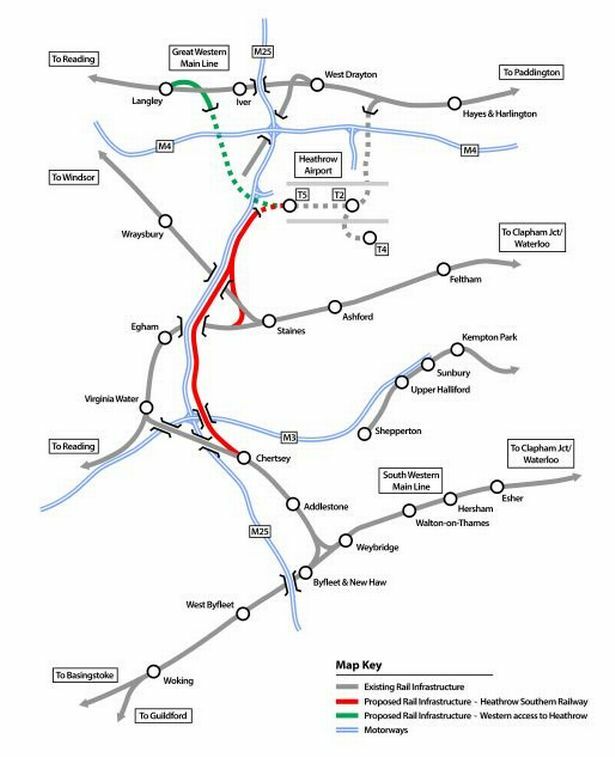 Most of the rest of such a route either exists or is already being built, such as East West Rail between Oxford and Bedford. The Windsor project includes a new railway in tunnel connecting the two existing stations at Windsor, with Riverside being replaced by a new central station and transport interchange. A new railway would be built connecting the present Windsor Riverside line with Heathrow Terminal 5, with several possible routes identified. The cost is being put at £375 million, to be funded by the private sector. Investors would also bear the risk of any cost overruns. Promoters of the Windsor Link Railway have published a strategic case, and a formal feasibility study – a ‘GRIP 2’ report – has now been submitted to Network Rail. The Windsor Link report was prepared by engineering consultants Pell Frischmann in collaboration with Network Rail, with support from Skanska Infrastructure Development. This scheme is separate from the other privately funded scheme called – Heathrow Southern Railway – which like the Windsor Link would use the two vacant platforms at Terminal 5 station. Posted: Saturday, August 26th, 2017. Filed in General News, News about Airports, Recent News.